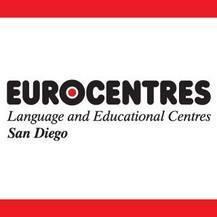 Welcome to Eurocentres in the beautiful San Diego, a Division of International Educational Services, LLC! We put our focus on offering quality instruction to local and international students who have the desire to develop the skills needed to succeed in their careers, social interactions and university studies. It is very important to us that our students are not just passive observers in lectures, but dynamic participants in problem solving and discussions. Due to small class sizes we guarantee quality interactions with classmates and instructors for an optimum way of learning. Our highly skilled and experienced instructors are ready too meet all your questions and needs. In Eurocentres San Diego you can learn with a diverse group of students representing countries from around the world! This is the core of the student’s program. The class instructor carefully plans a balanced, fully integrated, varied program based on the student’s learning needs. Six lessons per week are taught by a second teacher, who liaises closely with the main instructor in implementing the weekly plan. Each Friday during the review lesson students have the opportunity to look back over the week and make suggestions for the following week. This approach ensures a goal-oriented learning program for both short-term and long-term students. Intensive 25: afternoon classes meeting two times per week (M&W or Tu&Th). Classes include General Language; Business; IELTS Preparation; TOEFL Preparation; TOEIC Preparation. Classes include General Language; CAE Preparation*; FCE Preparation*; IELTS Preparation; TOEFL Preparation; TOEIC Preparation. This intensive course focuses on the skills needed to be successful on the Cambridge Advanced Certificate exam. Students will be prepared for this exam through extensive language skills raining and exam practice. Those areas covered include academic reading skills, academic writing skills, listening skills, successful strategies for the CAE speaking component, academic vocabulary, and English in Use. The school will help candidates register for the exam at the local exam center. This course focuses on key skills tested in the FCE exam. Students will be prepared for the exam through a combination of language skills training and exam practice. Key study areas include reading skills, writing skills, exam-oriented listening skills, successful strategies for the FCE speaking component, topic-based vocabulary, and focus on English in Use. The school will help candidates register for the exam at the local exam center. Students who demonstrate English proficiency at Level 5 or above can prepare to take the internet-based TOEFL, a requirement for entrance into most American colleges or universities. Students will learn and practice academic vocabulary, writing effective academic essays, communicating opinions and summarizing academic passages in clear, logical spoken English as well as developing their reading and listening skills in order to comprehend academic textbooks and lectures. TOEFL students are given complete practice examinations which replicate the actual exam. This practice exam, along with quizzes and assignments, is an indicator of the student’s progress in the course. Generally a student should be able to prepare for the TOEFL exam and reach the target score within twelve months. This course focuses on key skills tested in the IELTS exam. Students will be prepared for the exam through a combination of language skills training and exam practice. Key study areas include academic reading skills, academic writing skills, exam-oriented listening skills, successful strategies for the IELTS speaking component, topic-based academic vocabulary, remedial grammar linked to exam-based productive skills. Open to students at Level 4 or above, the TOEIC class prepares students to reach their target scores on the TOEIC exam, which can be taken monthly at Eurocentres San Diego. Designed to give students maximum exposure to language skills and drills that will help them become more confident and competent test-takers, this course focuses on the two general areas—listening and reading—that are evaluated on the exam. The class is divided into four equal parts: an introduction to business and professional vocabulary; reading comprehension focused on such genres as business letters, memos, newspaper articles, advertisements, and notices; listening comprehension focused on the four specific areas of the TOEIC exam; intense grammar review that focuses on the types of English structures most frequently found on the TOEIC exam. This course, which may be offered on campus or on site, is designed for students at all levels who desire to improve their English proficiency for the workplace. Although not a tutorial, the class will focus on the English vocabulary and skills that specific groups of workers need to advance in their profession. Work-related vocabulary, fundamental grammar, business and professional writing, and work-themed listening and reading exercises will be the focus of this course. Workplace English is designed more for local students who have immigrant status, and thus it may not offer enough hours per week to satisfy the requirements for international students on an F-1 visa. International students expressing a desire to take this course may receive written permission from the school to enroll in Workplace English if it does not interfere with their current English program and if there is available space in an existing class. The Eurocentres was important for me to improve my English. I liked the teachers, of the method. Probably I will come back. I want to thank Eurocentres for a great time I spent in San Diego. The teachers were wonderful and the staff was very helpful. I learned a lot of new things during my stay. I would definetly recomend Eurocentres to my friends because of the great atmosphere that is presend in the school. I had an amazing time in this school. The teacher and the staff are so kind and helpfull. The teachers personalize their class according to your needs or desires and they are so funny. Everyday is a pleasure to come to school. The staff are so kind, they really take care of the student like family. The only thing I would change is the activities. Not enough activities outside and facilities of transportation to do activities. I had an amazing experience at Eurocentres San Diego! I had the opportunity of learning and improving my english a lot. Besides that, the environment there is amazing, everyone treats you like family! I would recommend Eurocentres to all my friends! great school my English has improved a lot. eurocentres has been amazing. The teachers are very professional and have a good relationship with the students. The people who work at eurocentres are very friendly. The spaces in the school are fresh and with iluminacion.San Diego is an excellent city to be all the time, to go to the beach also to go to museums . It is important to have contact with people from different parts of the world to grow in the cultural part. I've been here for almost a year. I had a really good experience and my English was improved because of friends and teachers. I will recommend Eurocentre to everyone!!!! I just wanted to take some time to express how much I enjoyed being in San Diego Eurocentres because is the best school to come and learn English. Also, knowing a lot of people around the world and making friends from different continents. The professors are outstanding because they are so hard dedicated to their students. Furthermore, they always made extra sure you understand the lessons and you would always be able to count for extra help. I will never forget all the fun activities the teachers included in my class to enhance my learning. I especially loved how they always related the lessons to a real-life IELST program that would allow me to improve in many areas such as vocabulary, grammar, reading, listening and writing. The staff at San Diego Eurocentres are always willing to help you with anything you need. Also, they are so cool and kind that you will almost feel like home. The school activities are so amazing and cool you can always choose something great to do. I remember the day I came and my level skills were 6 and know I was able to reach an 8 because of all of you. Thank you for giving me confidence in every English skill. Thank you for these greatest 7 months and for always going the extra mile as a teacher. I appreciate it more than you will ever know. Hello, I'm one of the Eurocentres San Diego language schools student. I would like say about this school couple things! First of all school has prefect study materials and great teachers! Teachers are knows way how to teach well. Furthermore, teachers individually can help you with all your flaws. Secondly, the stuff members are really cool! When I had some problems they always were willing to help me! School always has "School activities" for each month and student can meet new people outside the school! Thirdly, atmosphere at school very nice and comfortable. Every one is friendly and smile. At this school you feel like It's your second home! Overall, It's pleasure to me to recommend Eurocentres San Diego!